January 2009 saw Nancy-Université unusually concerned with eternall salvacyon and saynte charytye as IDEA hosted a two-day conference devoted to the late medieval English morality play Everyman. 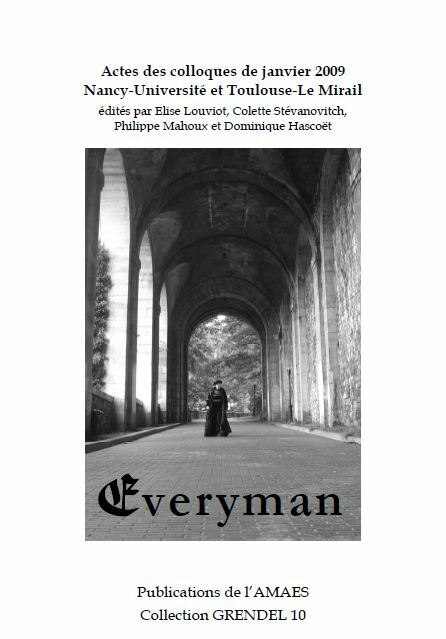 The decision to focus on Everyman precisely this year was not a coincidence: Everyman was one of the set books for the Agrégation in 2009 and it was clear students would welcome any help to approach a work steeped in a culture and ideology quite distant from ours in many respects. This type of conference is always both a challenge and an opportunity for students and specialists from several disciplines to confront their interpretations of a literary work, and this event was no exception. The papers presented drew from disciplines as varied as theology, philology, drama studies and history, and we were also fortunate in that Douglas Morse – who directed a film adaptation of the play in 2007 – kindly accepted to come present his work, thus providing us with yet another type of interpretation of the play, and, perhaps most interestingly, with a way for us to test the theories exchanged during the day by confronting them with their onscreen manifestation. Proceedings of the conference were published by the Association des Médiévistes Anglicistes de l’Enseignement Supérieur, Everyman: actes des colloques de janvier 2009 (2009).